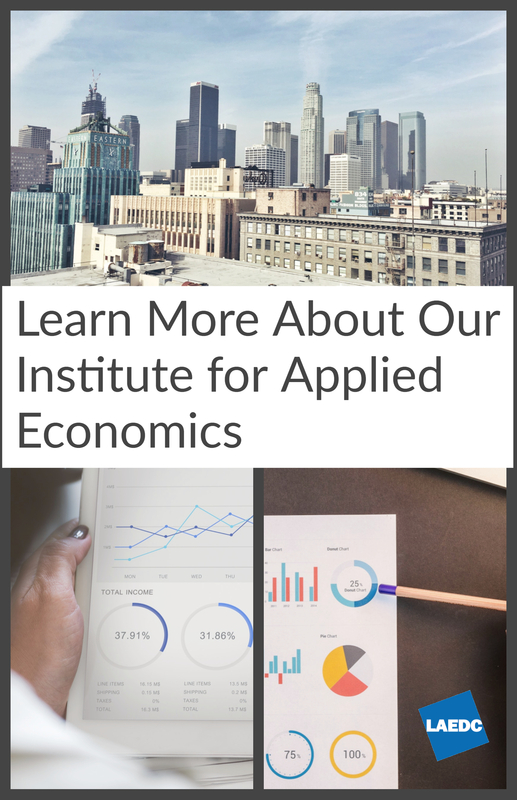 The Institute for Applied Economics at LAEDC performs objective economic research and analysis for a wide range of clients, detailing economic impact of development, business operations, and regulation, as well as providing intelligence about specific industry clusters, labor force, and workforce development issues. The Institute’s reports provide decision makers with critical information from which to make informed decisions. In addition to providing on-demand research per client requirements, the Institute also conducts foundational research to ensure LAEDC’s many programs for economic development are on target, including the company’s collaboration with workforce investment boards, its award-winning business assistance program, and its work on the L.A. County Strategic Plan for Economic Development and its cluster development initiatives. The Institute’s mission is to provide objective and unparalleled economic and policy expertise to our clients and the broader public audience. If you have any questions about IAE or would like more information on how we can best assist you, please email [email protected], or call (213) 236-4840. The listing below illustrates IAE’s broad depth and experience, and presents just a sampling of the services provided by IAE. Not all reports are publicly available due to confidentiality and client requirements. The Institute for Applied Economics was formerly the Economic and Policy Analysis Group. The reports underscore the immense amount of international connections that are essential to economic activities and jobs here in Southern California and L.A. County. Past and present clients include Burbank Bob Hope Airport, California Cable & Telecommunications Association (CCTA), California Manufacturing Technology Consulting (CMTC), Foothill Workforce Investment Board, Grand Avenue LA, Hospital Association of Southern California (HASC), J.P. Getty Trust, Los Angeles Biomedical Research Institute, Los Angeles City Workforce Investment Board, Los Angeles County Community and Senior Services (CSS), Los Angeles County Department of Regional Planning, Los Angeles County Metropolitan Transportation Authority (Metro), Los Angeles County Museum of Art (LACMA), Los Angeles Department of Water and Power (LADWP), Los Angeles World Airports (LAWA), Metropolitan Water District (MWD), Motion Picture Association of America (MPAA), Pacific Gateway Workforce Investment Network, Plains All American Pipeline, San Gabriel Valley Economic Partnership (SGVEP), Sony Pictures Entertainment, Southeast Area Social Services Funding Authority (SASSFA), Southeast Los Angeles County Workforce Investment Board (SELACO WIB), Southern California Association of Governments (SCAG), Southern California Leadership Council (SCLC), Western States Petroleum Association.